It has been too long since I last updated the ol’ blog, but who’s complaining? I haven’t missed the occasional blog update at all–I’ve spent most of the last year and a half on my bikes and/or in the mountains. This is one of the two reasons we moved back to Utah (living close to family being the other), and we/I are/am finally adjusting to living here and actually really enjoying it. Rather than give you a run down of the last 18 months, I thought I would start with this last weekend and move forward with more regular updates. I plan to primarily focus on hiking and biking in and around Utah, eating good food (wherever it may be had), and anything else that suits my fancy. Moreover, I have not had the easiest time finding websites identifying epic Salt Lake-based hikes suitable for children, so I will try to provide that here given that my most common (and certainly my most enjoyable) ventures are accompanied by my three-and-a-half year old (Logan) and my five-and-a-half year old (Noah). Therefore, I will generally tell you if the hike (or whatever) is doable with kids. Be forewarned, however, that Noah in particular is no slouch when it comes to hiking, so just because my five year old can do a hike without complaint doesn’t mean you’ll have the same experience with your teenager! Anyway, here goes …. Getting There: Big Cottonwood Canyon, Mill B South. This is 4.3 miles up Big Cottonwood Canyon (at the bottom of the S-Curve), and a mere 15.5 miles from my driveway. There are actually four Wasatch canyons closer to me than Big Cottonwood–see what I mean by accessible? The trailhead is at the east end of the parking area (it starts as a paved trail next to the restroom) at the bottom of the S-Curve in Big Cottonwood Canyon. The trail turns to dirt, crosses a bridge over the Mill B South Fork creek, and begins a long ascent with a few flat stretches. Hiking Distance/Time: 3 miles (almost exactly), one way (this makes it 6 miles round trip). Plan on around 2 hours up, 1.5 back without kids, or 3.5 hours up and 2-2.5 back with kids. My kids like breaks, like throwing rocks and picking up every stick within spitting distance of the trail, etc., so we take our time getting up. At 3.5 hours though, I think we moved at a pretty good clip, and with my 51 pound pack, I was a bit drained at the end. I plan on working on that, as cycling legs don’t necessarily make good sherpa legs. Difficulty: Strenuous (especially with a 50+ pound pack). My scale has three levels: weak, moderate, and strenuous, and my scale adjusts based on my feelings the particular day. I imagine I would consider Lake Blanche moderate if I had a simple day pack or if I had summited Mt. Olympus the weekend before (this will be the subject of a later post). But, at nearly 1,000 vertical feet for each mile traveled, the Lake Blanche trail will give your lungs and legs a good workout (take plenty of water). This is a traditional single-track trail, but with several steep sections and some small bouldering areas. That said, Noah made it all the way up and down without any help. He’s a tough kid with a motor that doesn’t tire. Logan would have made this hike, but we wouldn’t have been able to finish it before dark. Noah was definitely the youngest kid on the trail–we saw a few kids in the 8-10 year old range and plenty of tweens, and they all seemed to be doing fine (or at least they acted that way when they saw a 5 year old on the trail). Bottom line: if your kids have hiked quite a bit, have good balance, and are somewhat tough, you’ll be fine. If your kids haven’t done much hiking, or if your idea of hiking is walking around the track at the high school, you might want to skip this one for now. Beauty Quotient: Unsurpassed. You won’t be wishing the area was more beautiful. Don’t take my word for it–look at my pictures or others on the interwebs. Solitude Quotient: Reasonable. There are plenty of secluded places to camp. The trail was somewhat crowded during our Saturday afternoon return, but it wasn’t bad. 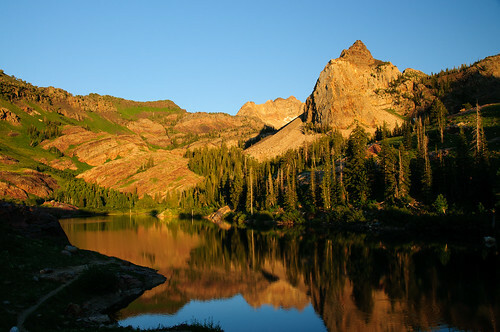 My Take: The Lake Blanche trail is one of the most popular hikes in the Wasatch, and for good reason. 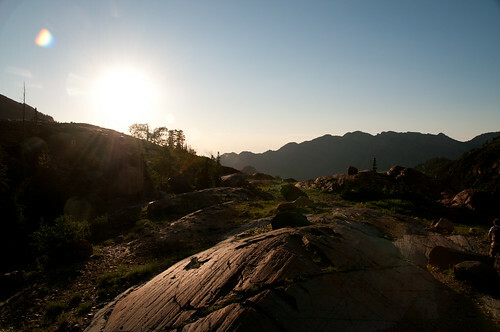 It is close, accessible, and the hike provides unparalleled views. 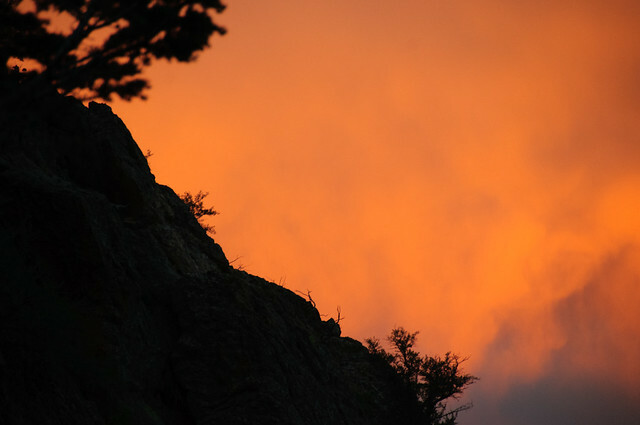 After crossing the creek and hiking through the scrub oak, you will reach beautiful aspen groves with occasional pine, plenty of wildflowers, and beautiful views of waterfalls, the river (which the trail generally follows–more so the lower on the trail you are), and Big Cottonwood Canyon. 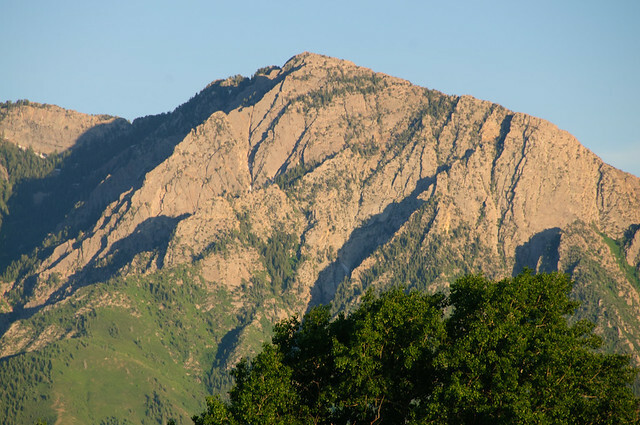 At the top, you will find the classic Wasatch views–beautiful water, jagged peaks, and even the Great Salt Lake in the distance. The trail can be somewhat crowded on weekends (our hike up on Friday was pretty calm, but there were many more people on the trail on Saturday afternoon as we made our way down), but when at the top, you will easily find solitude at Lake Blanche, or at one of the other two lakes just a few hundred yards away (Lake Vivian and Lake Florence). There are also plenty of great spots to camp, and plenty of streams from which to drink, but please remember to Leave No Trace. You’re also likely to see a bunch of wildlife (we saw two moose, one of which spent some time in our camp). Enjoy your time at Lake Blanche, and don’t be in a hurry to get back. The billable hour or whatever it is you live for will be waiting for you when you get back …. 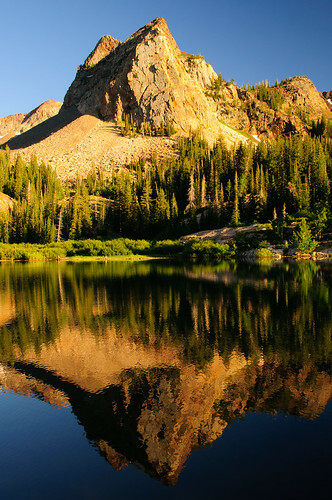 Sundial Peak is one of the Wasatch Range’s iconic peaks, with good reason. There is a lot of glacier-carved rock in this area, and it is quite fascinating. Unfortunately, I didn’t think to take any real pictures of it. This is the best I have. And finally, a rough map. As usual with Google’s terrain maps, the elevations don’t match the USGS 7.5 minute topo maps, but this will give you a good idea of how to get there.